As you probably know, breakfast is the most important meal of the day. In fact, regularly eating breakfast can help you shed pounds and maintain your Feel Great Weight. Eating early in the day keeps you from "starvation eating" later on and jumpstarts your metabolism, so your body begins to burn calories right off the bat. Including protein in your breakfast is also a big part of this weight loss equation since it helps control your appetite and maintain lean body mass. A new study suggests that consuming too little protein may actually cause you to store body fat. With that said, here are five high-protein meals to start your day off on the right foot and keep you satisfied all morning long! If you're an oatmeal lover, here's a great way to increase the staying power of your morning meal. The oats are replaced with protein-rich egg whites, a ripe banana for sweetness, and omega-3-packed walnuts and ground flax. 1. Whisk together egg whites and almond milk and then stir in walnuts, ground flax, banana, vanilla extract, and cinnamon; blend well. 2. 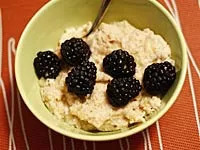 In a medium saucepan, warm the mixture on the stove, stirring frequently, until the “oatmeal” reaches the desired consistency; this should only take a few minutes. 3. Top with berries, nut butter, seeds, or whatever else your little heart desires. Bored with veggie omelets? Here's a twist on an old favorite! 2. Combine flour, baking powder, eggs, soy milk, lemon juice, and sugar in a large bowl. Mix well with a whisk. 3. Pour mixture into a shallow baking dish coated with cooking spray. 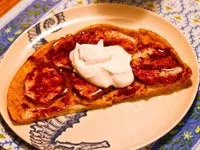 Arrange apple slices on top and sprinkle with cinnamon. 4. Bake, uncovered, for 18-20 minutes or until a knife inserted near the center comes out clean. Cut in half. 5. Serve with your favorite toppings like maple syrup or yogurt. Pancakes are one of my favorite breakfast foods, but most are made with refined flours and other "bad" carbohydrates. These pancakes include lots of protein from the egg whites, and the coconut adds a surprising dimension of flavor! 1. In a bowl, mix together ingredients until blended well. 2. Preheat a skillet (medium-low heat), spray with non-stick spray, and pour in batter. Shape into pancakes with a spoon if needed. 3. Heat until partially cooked and flip pancakes. 4. Once cooked through, top with shredded coconut, syrup, nut butter, fresh fruit, or any other desired topping. This protein- and nutrient-rich quiche is perfect for a Sunday brunch. Make ahead and just pop in the oven before you guests arrive. It tastes so delicious they won't even realize how healthy it is! 1. Preheat the oven to 375 degrees. In a greased 9-inch pie plate, overlap the tortillas to make a crust; place on a rimmed baking sheet. 2. Meanwhile, steam broccoli until crisp-tender, about 1 minute in the microwave. In a skillet, add the olive oil and heat over medium-high heat. Add the onion and mushrooms, season with salt and pepper and cook until the mushrooms are golden, about 3 minutes. Stir in the broccoli; season with salt and pepper. 3. Spread evenly in the tortilla crust, then crumble the cheese on top. 4. 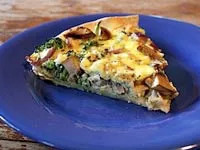 In a medium bowl, whisk together the eggs and yogurt and season with salt and pepper; pour into the tortilla crust. 5. Bake on the baking sheet until just set in the center and lightly golden, about 30 minutes. Let rest for about 10 minutes before serving. Don't have much time for breakfast? This smoothie comes together quickly, and it's loaded with protein, healthy fats, and fiber for some serious staying power!